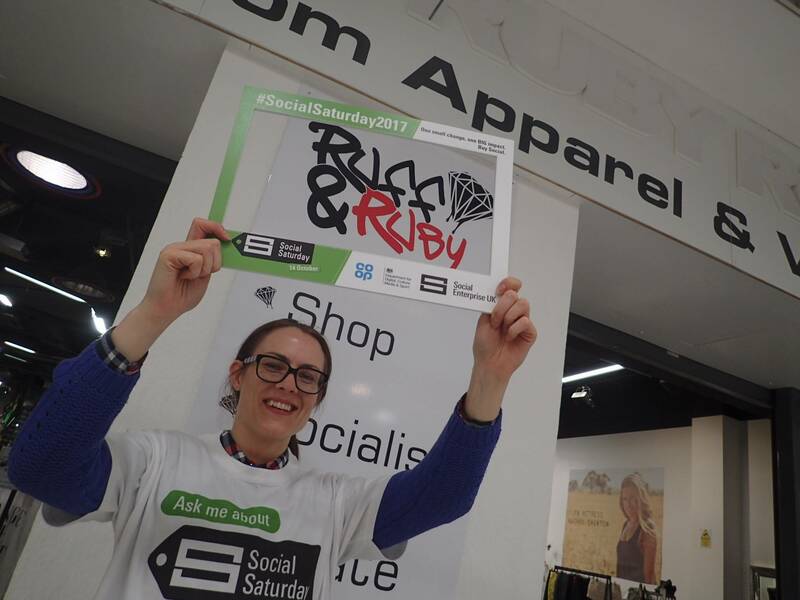 Working in conjunction with Ruff & Ruby Charity & Social Enterprise, we’re helping to host ‘Social Saturday 2017’. It’s an opportunity for our local social enterprises to come together to raise the profile of what they do. To shout out loud and proud on social media platforms like Twitter #SocialSaturday2017. These are our local community organisations who trade not primarily to make a profit, but to re-invest in our local communities, delivering social benefit and tackling local issues like low incomes, mental health, physical wellbeing, social isolation and environmental sustainability. This year’s event is being kindly hosted by Ruff & Ruby, who’ve developed a fabulous creative meeting, retail, activity, and play space right in the heart of our city’s main shopping centre (INTU Potteries). So come and visit our pop-up type marketplace event and take a look around the sort of work we do locally, and the goods and services we offer. Come and do your bit to buy local and buy social. We’ll be inviting shoppers to take a break, to come in for a browse, a chat, or even to have a go at something a bit creative. It’s also an event to inspire other local people to consider setting up their own community project or social enterprise – and learn from those who’ve already taken their first steps to becoming social entrepreneurs. We’ll have funders UnLtd present to discuss your ideas and help you understand ways to take your project forward. We also hope that some of the local larger corporate, ‘for profit’ businesses and Staffordshire Chambers members to come down and support us – it’s a great opportunity for them to network with us and take a look at what we do. To understand how they can add ‘social value’ just by trading with us, and making more impact with their purchasing decisions. 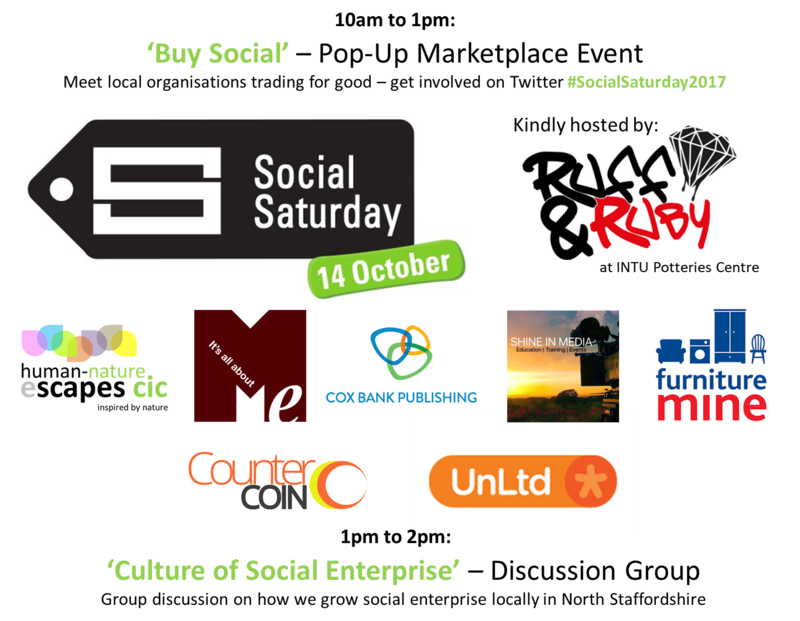 The Marketplace Event will take place between 10am and 1pm in parallel with simultaneous online Twitter Campaign to raise the profile of local Social Enterprise #SocEnt, Social Impact #SocImp & Social Value #SocVal. We’ll also be introducing ‘Counter Coin’ – a neat local currency idea just emerging, that can be used to reward volunteering, by using up what would be otherwise wasted capacity at local visitor attractions, activities or events. On top of the marketplace event, we’re also inviting other local social enterprises and community organisations to join us in a discussion event titled ‘Culture of Social Enterprise’. Hosted by Alex Philips from funders UnLtd, at 1pm to 2pm we’re open up dialogue to assess how Stoke and North Staffordshire grows from what is already a ‘hot spot’ for social entrepreneurial and community activity – to a more formally recognised ‘Place’ of Social Enterprise’. Using the phrase ‘creating a culture of social enterprise’ might be our first step, and these words of course link naturally and seamlessly to the city’s ambitions of becoming UK City of Culture in 2021. Developing local social enterprise not only helps to drive better community cohesion and social benefits for our local people, it can potentially help to drive our economic prosperity and provide jobs too! Linking our ambitions of ‘Place’ of Social Enterprise to our City of Culture bid might in fact strengthen both initiatives – in making our local area truly ‘the place to be’.